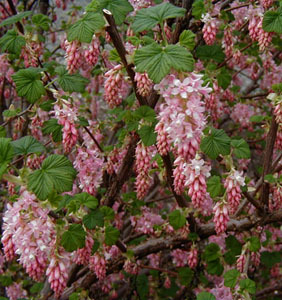 Joy Creek Photo Archive (c) all rights reserved A chance discovery in the Columbia Gorge, the pink flowered Ribes sanguineum 'Pokey's Pink' extends the color range of this deciduous shrub giving us yet another color choice for our spring gardens. A treat for the early season hummingbirds and good nesting cover as well. Early spring. 6 ft. x 6 ft.